The Deosi plains journey is the last of the long hauls that I want to do. By that I mean it's a trip through poorly catered for country where decent hotels and restaurants are seldom found. The past few days have been spent resting and eating as much as I can possibly eat in Gilgit. This includes chips and fried eggs, at least 6 smallish chocky bars and 500g of pistachios daily. 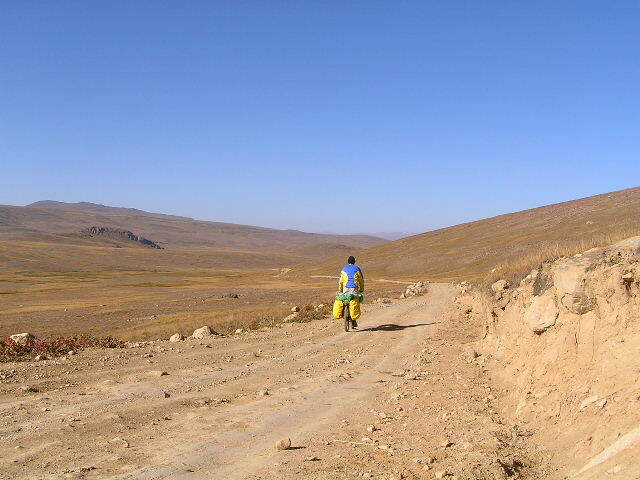 After this I set off south down the Karakoram Highway (KKH) before turning east into the Skardu road. For the next 170km I'm going against the flow of the river Sindh below to my right and therefore gently climbing uphill all the way. My satring point is at 1500m and my highest point on the Deosi is 4200m, so there's plenty of climbing to be had. The Sindh is a mighty river and roars below and when I see rapids it means I have to climb harder, and there are many rapids! The valley is nothing to write home about. It rises sharply and blocks out the views and there are few villages to pass through. My highlight on the first day is when my front bracket on my front pannier broke sending the pannier and the bag under my front wheel and the bag then dragged along under my peddles till I came to a stop. I was very lucky not to be thrown off! I made a bodgy repair and carried on. Next morning segregated all my possibly infested clothes into plastic bags and ate only fried chapatis and chai....again! The valley was much the same as before. Then I stopped at a chai shop for tea and biscuits and started talking to a man with one leg who claimed to be a ralatibve of Genkis Khan....Mnnnn. Anyway....we had a chat and he told me of a polo match in a nearby village so I decided to head there later on in the day as it was on my way. I found an amazing resthouse with a massive room and settled in and hung my infested gear in the sun before heading into town for food. In town everyone was asking where is my bike. This was strange as I had stopped 2km before the town! Jungle telegraph is suppose. peaceful as it looks due to the earthworks behind me. After the usual fare of food I head the 3km to the polo ground. I'm the only white boy there and I sit on the far side away from the locals. But soon the all start swarming towards me and I have a staring squad of about 30ish strong. Then the band stops playing for a breather and so now I am really the centre of attention and literally 100 or so more locals head in my direction. I jump off the wall and head off for another quiet spot but I'm like the Pide Piper and all the locals (rats) swarm behind me. It's damn annoying but what can one do. I mean I don't like this but it's usually the tourists who are tracking the locals with cameras so I just grin and bare it! I'm also given the privilege of starting off the festivities by throwing in the ball to the waiting players. Now the problem is I want to take photos but can't very well abuse my almost royal position and duck off to do so. I mean I've never seen the Queen leave the royal box at Wembley and sneak around the touchline with her Kodak snappy!!!! Nearing the summit of a very tough and very rough climb to Deosi Plains. After a good nights sleep I head towards Skardu, about 75km away. It's the major town of the area and the base for the many expeditions into the awesome mountains nearby. 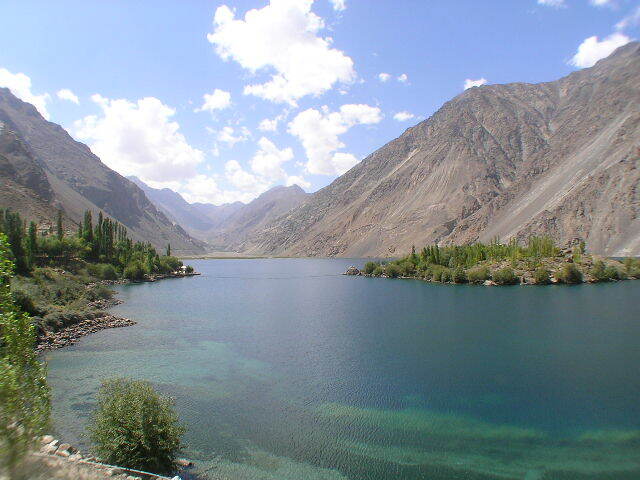 Pakistan has the densest area of high mountains anywhere in the world and they're just north of Skardu. It's the 50th anniversary of the first summit of K2 and Skardu has attracted a massive amount of package tourists and climbers alike this year. It's the only area of Pakistan to have had a rise in tourism but most of the tours would have been booked abroad so the Lions share of the profits will be abroad or stuck withing the boudries of the major cities. I checked into a lovely clean room and try to relax but I get a few bites on my legs before finding fleas in the carpet. A chilly moring sunrise on the Doesi. Hang around Skardu for 2 nights. 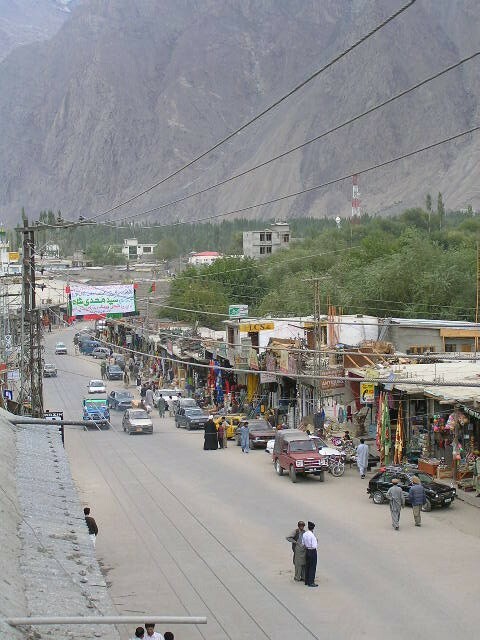 I've included a pikky of Skardu town by request and I'll pop a few more typical street scenes in the future. I've avoided it till now because it just becomes the usual stereotypical crap of cows and filth in the streets etc. Skardu operates purda which translates to curtain. This means that no-one outside a womans direct family should see her without a veil and here no women are allowed in the main streets. It's bazzar really as one would expect them in the markets. Lone foreign female tourists are often hassled a little (touched up) as they are literally seen as prostitutes (also a very common perception in India!). Women with male accomplices tolerated. No litter bins are provided in the streets in Pakistan. Usually, as in Skardu there are open sewers collecting grey water (non-toilet water)...BUT....this gets blocked by the litter in the open gulleys and the water stagnates and turns into brown water (POO!) and spreads disease. The stagnent water also attracts huge amounts of mozzies and flies. If you think of England then street scenes like this were before Victorian times. It shows how far behind countries like Pakistan are. There are very few places in Pak or India that have any kind of planning or building laws (or they might have them but a few dollars in the right direction overrides them!). Anyway....after getting a new bracket made for my front rack I head off 10km upto Sadpara lake and relax a little. The lake is incredible. It's soo clear and full of trout but it costs a staggering U$10 for a daily fishing permit....the locals pay less than U$0.50! I can see the Deosi top from the lake and the last few days the weather on the Deosi has been awful and the snow line drops to around 3500m. It'll be too hard to pass over if the weather is that bad.